Microtransactions Coming To Garden Warfare This Week. Thank Goodness. Were I a much younger man with tons of free time and no family to worry about, the fact that soon players will be able to purchase coins in Plants Vs. Zombies: Garden Warfare might annoy me. But alas, I am absolutely thrilled. In an EA blog entry posted on Friday, producer Brian Lindley confirmed the launch of microtransactions, an addition to the game that was not unexpected — and in some cases mildly begged for. 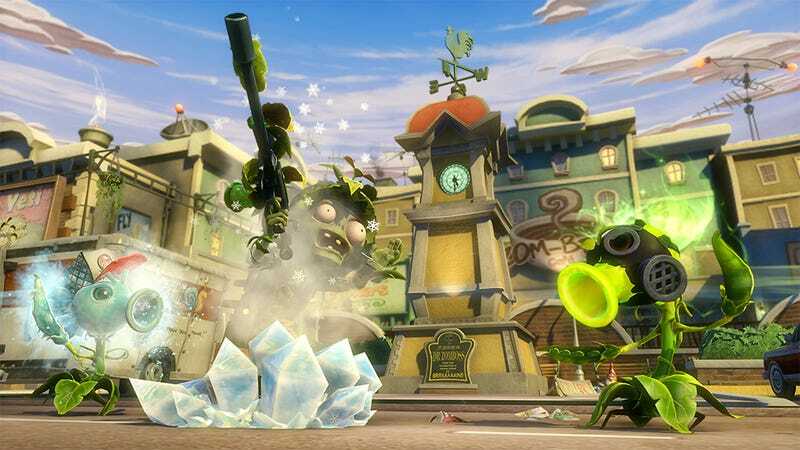 Coins in Plants Vs. Zombies: Garden Warfare are normally earned through simply playing the game. If I focused on the game for a couple of hours, I could probably earn 40,000 or so. These coins are used to purchase sticker packs, which offer cosmetic items, weapon upgrades and resources, as well as multi-part stickers that unlock the game's alternate character types when completed. I've been playing on and off since launch, and I've unlocked four variant characters. As of the recent Zomboss Down free expansion, there are 48. So yeah, I could use a little help. Buying coins won't give anyone an unfair advantage in the game — dedicated players can earn the same equipment through playing, and since the sticker packs are for the most part random, it's not like there's any cherry-picking involved. The game also features special modes where no unlocked characters or upgrades are allowed, for those looking for an experience unsullied by wealthy players who haven't worked for their Dolphin Gun.